The Democratic Republic of the Congo has a film industry! Who knew? 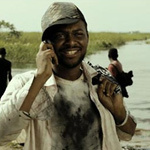 Even more intriguing is that it has produced an action/gangster flick that takes place in Kinshasa. With infectious Congolese hip hop on the trailer, Viva Riva!looks like it’s worth seeing. Riva (Patsha Bay) returns to town with a load of gasoline, which the city has been thirsting for. At the same time, he falls for Nora (Manie Malone), the girlfriend of the local warlord, Azor (Diplome Amekindra, giving us a solid cinematic heavy). Meanwhile, the Angolan men he stole the gas from are hot on Riva’s trail. Helping him out is the small-time commander of local forces who can’t be too overt in helping Riva, and a street-smart kid who admires Riva and wants to join his gang. There are also subplots involving Nora’s earring, Riva’s dead brother, and the situation with his parents. Writer director Djo Munga spends too much time on plot for my taste. Keeping up with the various henchmen, sources, and sidekicks became a chore after a while. Perhaps if the performances were more uniformly believable or if the emotion were more consistent, it would have felt more like texture than noise. Riva himself is at times a lover, a fighter, a son, and a mentor, and Bay is better at acting some of those roles than others. Viva Riva!will whip from one situation that has some resonance to another that feels flat and insincere. Viva Riva!does have great energy, though. Fans of B movies and gangster flicks looking for a new destination may not be disappointed. Viva Riva!is not The Godfather, but it is a tight, fast-paced action movie. And after all, how many of us can saw we’ve seen a Congolese movie?